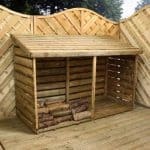 Here at WhatShed we are aiming to review all the major brands when it comes to garden structures and today it is the turn of TGB Sheds. We are going to have a good look through all the different kinds of products that they offer. We will also make sure you know what kind of quality the products are and if they are offering you good value for money as well. TGB Sheds may have only been around since 2007, but the two people who started the company have over 20 years’ experience in this field, so they do know exactly what they are doing. Interestingly, TGB Sheds only supply their products to approved trade stockists, so you may find it a little bit harder to track down their products online. 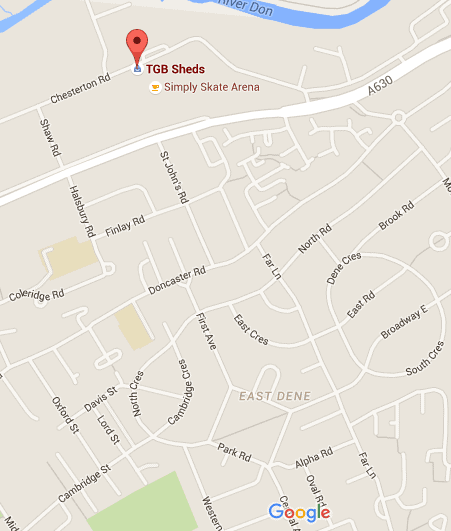 TGB Sheds: What Kind Of Products Are In The TGB Sheds Range? One of the things that we really like about TGB Sheds is how they have a good product range and they have chosen to focus on a few main items rather than spreading themselves too thinly. First of all, let’s take a look at what they are offering when it comes to sheds. TGB want to make sure they have sheds for everyone, no matter what their budget is. They have a standard range of apex and pent sheds that are made for those who do not want to spend a whole lot of money. They also have a range of superior made and more security based sheds as well. In all we are very impressed with their range of sheds. They even have things like potting sheds, garages and cabins as part of their sheds range. 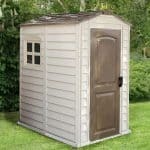 They also have a very wide range of summerhouses that are available in all kinds of sizes. We really like how they have some old school looking, Georgian style summerhouses as well as some more unusual hexagonal shaped ones as well. Sheds and summerhouses are not all that TGB have to offer you. One thing that really caught our eye was their line of kids playhouses. They have playhouses to suit children of all ages. For the really little kids they have this adorable Toddler’s Retreat and for the older kids who like to have their friends round, they have their two story Hideaway playhouse. TGB also have general garden storage products as part of their brand as well. These range from smaller storage boxes to keep a few tools or kids toys in, to kennels and other such structures to keep your pets safe. The last category of products that TGB offer is their Tanalised range. 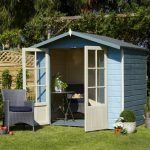 Tanalised is just a fancy way of saying pressure treated, but if you want a shed or summerhouse that is low maintenance then this is the section you should be looking in. TGB Sheds: How Is The Quality? One thing that we have to give TGB Sheds a huge pat on the back for is that not only are they using high quality timber for their products, they are also making sure to do their part for the environment by making sure the timber they use is from suppliers who are FSC/PEFC registered. They even use a water based wood treatment that is known to be environmentally friendly. 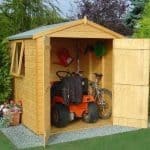 While that is all good and we applaud them for it, we are sure you want to know if a TGB Shed is going to be still standing in your garden ten or more years after you have installed it, and we can say that the answer to that is a yes. Not just because of the materials, but because the design of these products has been done by people who clearly know what they are doing. These sheds and other products are designed to give you many years of use. When we looked at all of the products that are part of the TGB Brand, one of the first things we noticed was that as standard the majority of their products are made with high quality tongue and groove cladding, which not only has a really sleek and smart appearance, it also ensures that no water is getting into your shed, summerhouse or the kids playhouse. We really like how they have used this style of cladding for all of their products and feel that it does show that TGB want to make all of their products as high quality as they can for the price they are asking. TGB Sheds: How Are The Products Priced? Finding TGB products online is not as easy as it is with some of the other brands that are out there. While we did manage to track some down online, TGB seem to want you to contact them on their site and then they will send you the information for your nearest TGB approved retailer. Anyway, the products that we did find suggested that TGB is not what we would call a ‘budget brand’. We do not mean that they are overly expensive, as after all as standard they are giving you some very impressive features such as the tongue and groove cladding and a strong braced door. But some of their smaller sheds are priced at more than some people may be willing to pay. 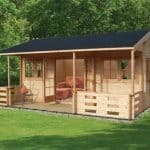 For example, their rather compact 6 X 4 Standard Shiplap Apex Shed is available for £360.99, which for the quality of it is not a bad price, but we must say we have seen similar sized sheds to this for sometimes half the price. While we have seen other brands offer similar sized products for less money, there are still some great deals to be had with the TGB range. A great example of this is their Toddler’s Retreat playhouse that costs £214.99, which we know may sound pricey for a playhouse, but this thing is built like a tank and can take whatever the kids can throw its way. The strength, durability and ability to last many, many years that this playhouse has, is actually what all of the TGB products have, so while they may cost a little more than some of the other brands, you can actually accept that when they are so well made. The only issue we did have was with some of their larger products. Their 12 X 8 Rhino Shed, for example, is going to cost you £1607, which for a shed of this size is a lot of money. While we applaud the high quality way that their sheds are made, it does mean that as the sheds get bigger the price has to increase quite dramatically. 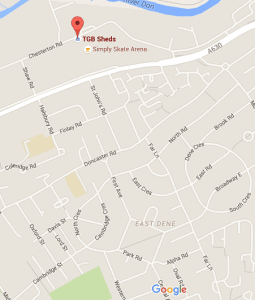 TGB Sheds: How Customisable Are TGB Sheds Products? TGB Sheds are great for letting you tinker with the design of the shed, summerhouse or whatever it is you are buying. While their site will always tell you what the standard version of a particular product will come with, they do also let you know what kind of modifications you can make. While we really like the standard tongue and groove cladding they use, you can actually change this to be log cladding or thicker, premier cladding. They even give you the option to have a thicker and stronger frame which is something not many other brands do. Flooring, windows and roofing options are all available for your consideration. While changing things is obviously going to cost you more money, we still really like how they give you all these options. We would love to see, and can just imagine, how incredibly strong a TGB shed would be with all their extras added onto it. If there ever is a zombie apocalypse, that is the kind of structure we want to hide in. TGB is a great brand that have a nice selection of products that have all been made to be the highest quality possible. We are very impressed with the build quality and in just how robust all of their products are. We know that the prices they are asking may make some people raise their eyebrows, but we honestly feel that for this kind of quality the prices are right around what we would expect them to be. We really like this brand and hopefully in the future they will ease up a little bit on who they let sell their products. 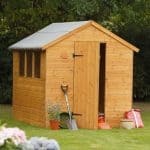 I purchased a shed from TGB recently and was advised to treat it with something – I can’t remember what was recommended…please can you advise? You should check out our how to treat wood page. This will pretty much tell you what you need to do. I have an outstanding complaint with this company, but despite calling daily I cannot get anyone to respond to my calls. I am forever promised calls back, bust sadly they never happen. Communication and customer service is very poor in my experience so far. I will soon be forced to escalate my issues further. Sunningdale fitted – leaked massively … water all over the floor … hugely disappointed with poor quality construction and with customer service! Hi , own a 8 x 6, 3 window shed, with opening window. Fitted by MPM Fencing Maltby. High quality shed and base, the same high quality of service was received from the fitters MPM at all times. Pleasant to deal with, would recommended without hesitation to anyone.